These distinguished sterling silver cufflinks are handmade from the keys of real vintage typewriters. For any author, writer, or lover of letters, these distinguished sterling silver cufflinks are made from the keys of real vintage typewriters. Pick two of the first letter of a name, or go with two different letters to form initials - either your own or those of someone you love, so you can really wear your heart on your sleeve. Created by designer Ward Wallau. Handmade in the USA and Mexico. Cufflinks are sold individually at $80, or $160 per pair. 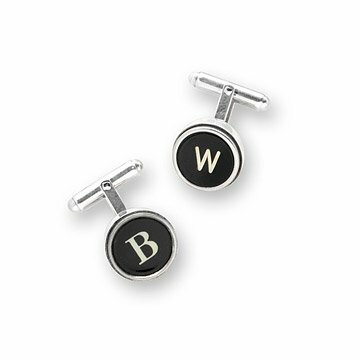 As the cufflinks are handmade from various typewriters, font, color and style may vary slightly. Note: Cufflinks are sold individually at $80, or $160 per pair. my husband, who loves cufflinks and all things vintage, adored these cufflinks. he now wears these to the most important events in our lives. not sold in a set which is deceiving when shopping. nice quality. great gift for a writer. Bought two as gifts assumed would be pairs and not single cuff links, I love Uncommongoods but this merchant is obviously confusing. Too bad the two I ordered weren't the same initial, since I could have then had a proper set. I got this for my husband and he likes them a lot. I bought these cufflinks as a gift for a close friend and colleague of mine who has two last names. He loved that they were both classic and unique, and really loved the "custom" feel of them (since I had purchased his initials). He said the gift was heartfelt and thoughtful, and would be a great conversation starter in his business travels. I am so glad that I purchased them! Pricing was competitive to stores that carried these sterling silver typewriter key cufflinks, but did not have the letters I needed. Uncommon Goods had the desired letters and the quick delivery was amazing. I was very pleased. Their packaging in T shirt bags is very appealing. I bought three so my son can mix it up! Really was better quality than I expected. The initials were very clear and precise. Gave a pair (two different initials) to my husband, who liked them very much. They're whimsical and of a good quality--I'd order these again. Great gift!